The NBA’s Summer League has been in existence for 13 years, and it has never been lit up like it was this year by Lonzo Ball. Not only did Ball fill up the sold out arena in Las Vegas, he also filled out the box score, notching the League’s first-ever Triple-Double. As if that weren’t impressive enough, Lonzo duplicated the effort in the very next game, for back-to-back Triple Doubles. His all-around dominance included FOUR games with double-digit assists (no one else has ever had more than ONE), one game with 36 points, and another game with double-digits points and 8 Assists IN THE FIRST QUARTER ALONE. He averaged over 16 Points a game, and over 9 Assists per game. He also affected the game on the Defensive end, with 2.5 Steals a game and 1 Block per game, and, he pulled down 7.7 Rebounds per game… and these games are only 40 minutes. Lonzo is THE TALK of the whole Basketball WORLD now, after wowing fans and critics alike. Doubters are dwindling fast, and his teammates and Coaches are constantly singing his praises. Just like Lonzo did at UCLA, he has INSTANTLY changed the entire culture of the Lakers. Every player is passing more, moving more, running more, as Ball has already lifted all their games to a new, higher level, which garnered the Lakers the Summer League Championship. Kyle Kuzma was the other Offensive star for L.A., as he kept streaking down the floor for outlets that no one but Ball (or Kevin Love) could ever be expected to deliver. Perhaps Kuzma, while playing at Utah last season, learned about Lonzo’s game more than the other Lakers did. Another big Offensive contributor for the Lakers was Vander Blue, formerly of Marquette. 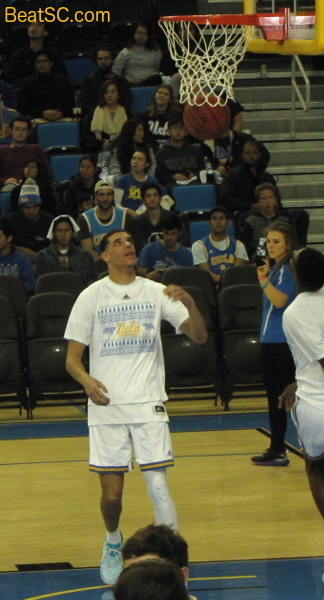 Blue seemed to lean towards one-on-one ball, but the TEAM ball that Lonzo was choreographing, with all the ball-sharing and extra passes, gave Blue ample opportunity to create shots. There is a chance that Blue and Kuzma could get a lot of playing time this year, which is huge — Depth is more important when you are playing at such a frenetic pace. Speaking of depth, several of Lonzo’s Assists came on passes to the three-point line where Bruin Travis Wear was notably reliable. I’m not expecting to see Wear log a lot of minutes for the Lakers, but as a lean big man with the range to sink three-pointers, he DOES complement Lonzo’s style, and could actually make the Lakers a Two-Bruin team! Of course I’m a huge Lonzo fan, but I have also been a Laker fan all my life, since the days of Bruin-Lakers Gail Goodrich and Keith Erickson. I stopped rooting for the Lakers when the trojan Busses hitched their wagon to ex-trojan Nick Young, but now that he’s gone, and Magic Johnson stepped in and made Lonzo the “Face of the Franchise,” I’m all in, and will be following them just like during the years when I attended one of the 33 straight, or when I was there in person for the second Threepeat. Go Lakers, go Bruins. "P(H)AT SUMMER(B)ALL" was published on July 17th, 2017 and is listed in Blue & Gold News. T-H, this is an off topic post, but do u know (with the new Under Armour partnership) if the Spirit Squad will also be getting new uniforms? Thanks.